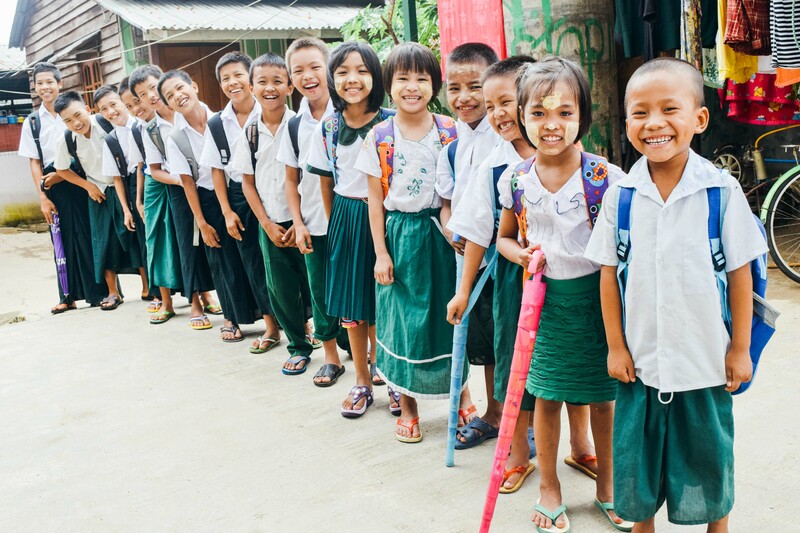 Photo: Children at one of our six Myanmar orphan homes are excited to be back in school. Today we bring you an encouraging update from Myanmar, beginning with the good news that all 130 of our orphans (ages 3-18) started back to school in June. This semester the children are studying their native Burmese language, English, math, history, geography, biology, chemistry, and physics at the different local schools where they are enrolled. Thanks to your support we were able to provide the children with many of the items they needed to start back to school such as backpacks, school uniforms, umbrellas, notebooks, pens, pencils, and new shoes. With your further support we hope to provide some of our high school students with bicycles since their school is a considerable distance from our orphan homes. From this, I realized that there was more importance long-term in living out our faith in caring for impoverished orphans than in my attempts to start a church. From that time on, we started adopting more and more children and established our orphan home which is now home to 40 children. From month to month we never know how our needs will be met in caring for 40 children, but by faith we continue on in this work, and the provision is always made manifest by God’s grace through the generosity of donors through Peace Gospel International. Our appeal at this time is for funding for our own home, as our landlord has decided he does not want such a large family living on his property, and no other landlord is willing to rent to us at this time. Thank you for your support and prayers. 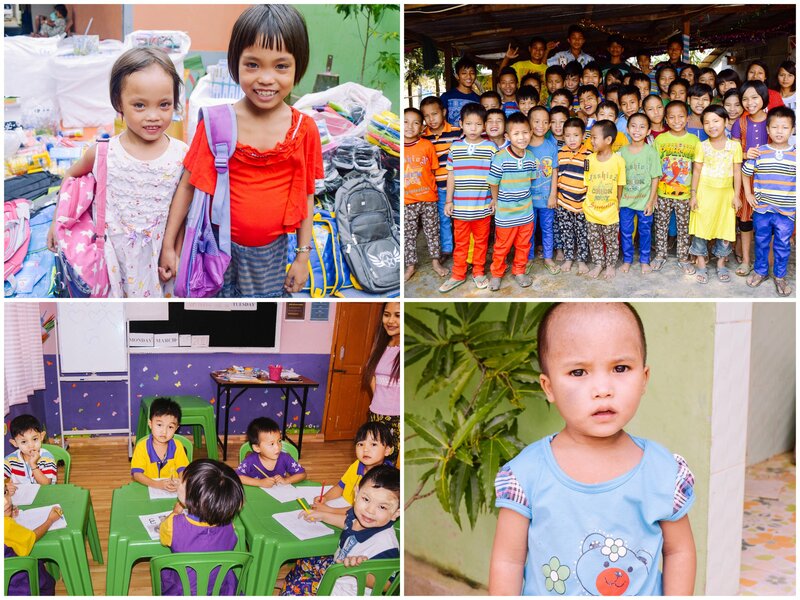 Photo inset: (Top-left): The 130 orphans in our Myanmar homes all received new backpacks, school uniforms, and other supplies to begin the new school year. (Top-right): Teekayem is the faithful director of this orphan home, caring for the 40 children who live there. (Bottom-left): Our preschool has been open since June 2016 and generates income from tuition paid. (Bottom-right): 2-year-old Ruby recently came to live at one of our orphan homes. In other good news, our preschool has been operating successfully since it opened and started offering classes in June 2016, thus we recently began our second year of operation with 6 students (ages 4-5) enrolled. Led by our 2 faithful teachers, the children are studying the English alphabet, their native Burmese language, and math. With your generous donations we are planning to buy materials for games to bless the children during recreational time, on break from their studies, and an additional small air conditioning unit because the weather is already unusually hot as we head toward summer. The preschool currently generates about $150 in tuition, and our expenses to run the preschool average out to around $200 per month. Thus, with your further support, we are seeking to raise $50+ per month to cover the remainder of our expenses. Our goal for the future is to reach as many children as possible with a 1:10 ratio of teachers to children, and to hire more staff members as we gain more students and the business aspect of the outreach becomes profitable. Lastly, to round out all of this good news, we want to share the redemptive story of a new child who has recently come to live at one of our orphan homes. 2-year-old Ruby was born in the Chin state where her father died when she was a newborn. Due to the trauma of losing her husband, Ruby’s mother developed some mental problems and abandoned her daughter. Ruby was very young and could not speak yet, and no one in her village was willing to take care of her. But one day a kind man saw Ruby and contacted our Myanmar field director asking if we could take care of her. Now Ruby lives in safety in one of our 6 orphan homes where she is happy, nurtured, and deeply cared for. Ruby’s favorite activities are singing and playing games with the older orphans who love her very much. Thanks to the love and support of her new family, she is now happy and starting to talk for the first time. If you would like to sponsor Ruby, just follow this link for information. Together with your help, we’re able to provide for beloved children such as Ruby a loving home centered on the Biblical truths of God’s love and hope. We are ever thankful for your continual prayers and generous support making the work that we do for these children possible.